Lapel pins are primarily for aesthetic purposes, therefore, the part of the pin that attaches to the clothing is designed to stay hidden from view, which is referred to as lapel pin backs or a butterfly clutch. The lapel pin needle is threaded through the clothing and a back is placed on the needle to keep the lapel pin in place. The back is not visible when worn, making the lapel pin more pleasing to the eye. You may have noticed that lapel pins have many different kinds of backs. Some have a safety clasp, but you will see post backs, military clip backs, tie-tac backs, cufflinks, charms, necklaces, earrings, and even leather key-fobs. These are called “findings” in the trade. One of the more popular lapel pin backs is the military clip using the newer rubber back or plastic back. 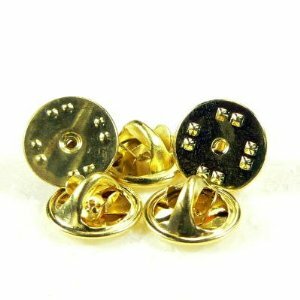 These lapel pin backs are very inexpensive, and stay on quite well. Metal Butterfly Clutch has been the standard lapel pin back for many years. It is lightweight, opens easily, and usually matches best to the actual pin. Metal butterfly clutch is also known as military clutch. Same as Metal Butterfly Clutch but with a slightly different opening mechanism. Deluxe Metal Clutches are somewhat easier to grip than butterfly clutch and are affixed more firmly. quality, solid brass, silver or gold plated pin back. Rubber PVC backs were introduced into the pin market a few years back. It is occasionally preferred over metal backs due to its easier to grip and durability. When ordering your custom-designed lapel pins you will have myriad of backing choices. Explore what best fits your needs. Are the pins being worn temporarily? are they going to be attached to a thick piece of clothing, e.g. a wool suit? are the pins going to be worn more than once or twice? All of these questions will help you decide on the backings of your choice. Lapel pins being worn temporarily usually go best with the metal butterfly clutch, they are easy to open and are more pleasing, in a way. Rubber backings are usually best for heavy wear. They are easy on the fingernails and are longer-lasting. 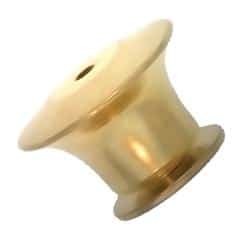 When ordering your lapel pins, our “PIN”gineers will discuss backing options with you and will help you decide on the best available backing. Our “PIN”gineers are as knowledgeable about backings as they are about the lapel pin itself.